• Katie White has been appointed General Manager of Atlantic Records in the UK. She was previously Managing Director of Vice Media’s i-D.
• Radiohead drummer Philip Selway has composed the soundtrack for a new Radio 3 drama, ‘Sea Longing’, set to air on the station this autumn. • Calvin Harris and Sam Smith have released the video for recent single ‘Promises’. • The reunited Culture Club have released the video for new single ‘Let Somebody Love You’. Their first album for 20 years, ‘Life’, is out on 26 Oct.
• Ash have released the video for ‘Confessions In The Pool’, taken from their latest album, ‘Islands’. The band will head out on a tour of the UK later this month. • Pom Poko have released new single ‘Follow The Lights’, their first for Bella Union. Their debut album is set for release early next year. 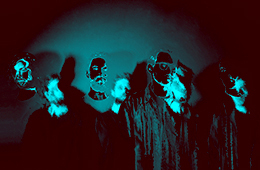 • John Grant has announced a whole load of new UK tour dates for 2019, kicking off at Leeds Academy on 30 Jan.